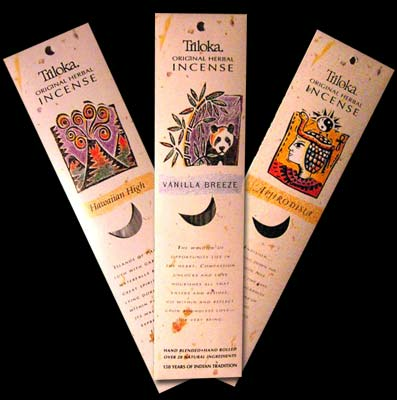 Each pack includes 10 sticks of wonderful smelling herbal incense sticks. Used traditionally for aromatherapy or purification purposes, each fragrance has a unique formula. Handmade by cottage industries in India, with 150 years of tradition. Since 1977, the Triloka brand has offered high quality hand-rolled natural incense. Triloka incense products are masala (mixtures of herbs, gums, resins, woods, oils), or masala-charcoal. Triloka incense can be enjoyed even after years of storage.